Perth's PT narrative has taken an interesting twist. Rewind to just before the last state election. The Liberal and Labor parties have been outbidding each other on public transport promises for the election. Labour's Metronet plan, promising up to six new railway lines, including the centrepiece North and South Circle and Ellenbrook Lines, was countered by the Liberal party plan to build MAX light rail to Mirrabooka along Alexander Dr, and an underground railway to the Airport, and beyond to Forrestfield. The Liberals won that election, so their transport plans should go ahead. Colin Barnett's plan did rely on federal funding, requiring 50% of MAX, and 80% of the Airport line costs in Commonwealth funding. Mark McGowan's labour planned to fund Metronet entirely from the state budget, but to be fair, where could we find the money? The Commonwealth should be willing enough to fund public transport; after all, its patronage is rising, and it is useful for saving the environment, growing the economy and transporting all. “The commonwealth government has a long history of funding roads. “We have no history of funding urban rail and I think it is important that we stick to our knitting and the commonwealth’s knitting when it comes to funding infrastructure is roads." Abbott may not have even had WA in mind, but this has enormous implications for Western Australia. If federal Liberal wins the upcoming election, one of state Liberal's cornerstones will be jeopardised. Last week on her visit to Perth, Prime Minister Julia Gillard poured cold water on Mr Barnett’s hopes, saying the Premier was not in a position to make promises about Federal funding. “Premier Barnett would have to go through proper assessment processes. However, she is the Prime Ministerial candidate more favourable to Colin Barnett and state Liberal's transport policies. The possibility of federal funding is better than nothing. In fact, Federal Minister for Infrastructure and Transport Anthony Albanese was proud of funding the Perth City Link project, and his party was not afraid to place a large article as an election ad in the West Australian. The ads contents are found here, I believe. “However, given the current Federal (Labor) Government’s support of $236 million for rail infrastructure at the Perth City Link and $3 million towards planning of the MAX light rail project, we expect that future Federal governments, whether Liberal or Labor, would consider the benefits of funding such important transport initiatives based on merit,” Mr Barnett said. “Mr Abbott has, well before the September Federal election, confirmed that any Federal Government he leads will not contribute to urban rail. “The Liberal Party spent millions of dollars during the election campaign telling Western Australians that both MAX light rail and the airport line were ‘fully funded’ and ‘fully costed’. This is especially prescient, as Tony Abbott pledged $1.5 billion to another tunnel across inner Melbourne, but one containing a road: The East-West Link. It has a Cost-Benefit ratio of only 0.7, meaning that the cost of building it is more than the calculated benefits from it. "Without Federal funding these projects cannot proceed. "We are lobbying both the federal Coalition and federal Labor ahead of the next election to get the best deal possible for Queenslanders." 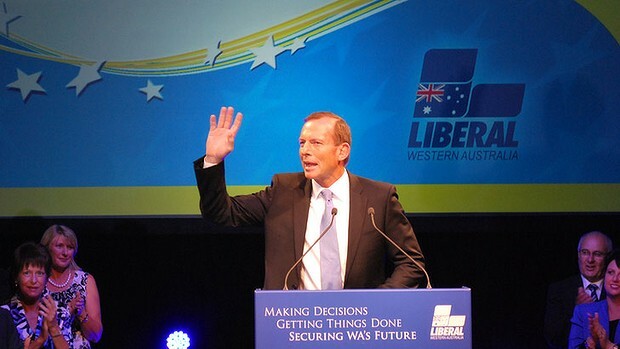 Abbott's refusal to fund urban rail runs counter to a previous commitment to $750 million towards the Moreton Bay Link. As far as I know, NSW Liberal is going it alone with its North West Rail Link, as a Public-Private Partnership (PPP), making it immune to Abbott's announcement. As we will see later, this is an example Barnett could follow. It may not be a bad idea for Tony Abbott to suggest that urban rail should remain a state responsibility, but he should remain consistent with roads. His pledge of $1.5 billion for the East-West Link, as well as $1.5 billion for the WestConnex in Sydney, is not consistent. He will fund urban roads, but not rail. This makes no sense, as in urban environments, rail offers more capacity than roads, resulting in greater economic benefits, and very little environmental impact. Urban rail is a wiser investment than urban roads. ''If Tony Abbott is elected, it will be a disaster for inner-city Melbourne. ''The suburbs that we love and that make Melbourne consistently one of the world's most liveable cities will be turned into a rat's nest of on and off ramps. “After much ducking and weaving, Mr Abbott has again confirmed his and the Coalition’s historical opposition to Federal engagement in urban public transport. “Such an unbalanced approach would lead to more gridlock, worsening congestion and a poorer quality of life in our cities. It is not completely accurate to say that the Coalition has a problem with public transport. Many state Liberal branches have attempted to shake their public transport legacy, appearing perfectly happy with public transport. WA and NSW in particular are big advocates of PT. It is the Federal part of the Liberals that dislikes public transport. It has failed to transform into a political option in touch with today and the future, and is still stuck in the past, with a 'more roads' attitude. There is a fracture between State and Federal Liberal evident. So what options are available for Colin Barnett, and any other state Premier's feeling shafted by Tony Abbott? Well there is the opportunity for Tony Abbott to leverage his ability to change his mind (what he says is 'not always gospel truth'), and backflip on urban rail, to save a few fellow Liberals. In the absence of that, there are still other avenues. States can build rail without Federal help, to follow NSW's example. If the states cannot fund rail from their own pockets, they can enter into a PPP, or otherwise employ the large land value gains around train stations. As a train station is built, land near it becomes much more desirable, due to the benefits of convenient public transport. There is a natural tendency to build TODs near train stations. Governments can tap into this with land value capture, though various taxes allowing the government to get a cut of any land value gains, since they paid for the rail infrastructure causing the gain. Professor Peter Newman of Curtin University is a proponent of land value capture. He believes that the whole cost of rail projects could potentially be funded through a land tax around stations. "I don't think [Mr Barnett] has any alternative. Having Federal involvement will make it happen quicker, but no Federal involvement will propel us into doing more with value capture - using land around the train line to help fund it." Funding options Professor Newman proposes in his Three Mode Plan include taxes (10% rate) on the increased value of residential and commercial properties, fees for commercial ($5 per working day) and retail ($5 day), and a 1% tax on the value of land sales around train stations. In short, transport politics is getting interesting.